If you are someone who likes to entertain, or simply likes to have friends around, then you want to make the best cocktails, to wile away the evenings and help make your party a great success. Now unless you have plans to hire a barman to make the wide range of cocktails available, the best option is to make your own cocktails at home. You will already know that to make that happen, you will need a good quality blender that can handle ice and help properly mix the drinks without the blender breaking the blade or doing a bad job of mixing the contents of your chosen drink. You may also know that in the UK market, there are a lot of blenders on the market, so the big question is how do you choose the best one for your needs? This detailed buying guide is designed to help you find the best blender for your budget to make the right type of cocktail. We also cover off what we believe to be the most important features to look out for when it comes to buying an affordable but high quality blender. What Type of Blender Can YOU Get for Your Money? If you have already searched for a blender, then you will be aware that the prices vary a lot. In fact most blenders range anything between £50 to £200 depending on what features you want to have, the brand that makes the blender, and of course the actual quality of the product. For commercial blenders used in hotels, restaurants and bars the price can be anything from £200 to £800. All blenders are electric blenders and the manufacturers will claim that they are all good at making cocktails. They will also claim that they are able to make frozen drinks with frozen fruits, and are also able to make smooties. It is only when you start to do a lot of research that you quickly discover that many of the cheaper blenders, actually get much better customer reviews. With many products you will have heard the old saying, "you get what you pay for." This is not actually the case when it comes to buying a blender that is best suited for making cocktails. The first question I always ask myself when it comes to buying any product, is how much I can afford and am willing to spend. It is the same with a blender. I like a good quality blender that works, but it is not something I use everyday, so I don't want to spend a fortune on buying a blender. It is trues that some blenders are really cheap and that is simply because they are poorly made and just plain old fashioned poor quality. Some others are cheap because they only have a few basic features. When it comes to making cocktails, the main thing you want your blender to be able to do is to crush ice. 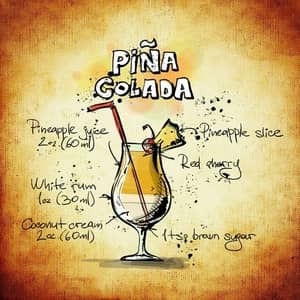 The reality is that you really don't need any of the fancy features on a blender for the purpose of making any type of cocktail drink. Likewise for making a smoothie you want it to be able to crush ice and frozen fruit. Again there is no need for any other type of feature. Depending on your preferred brand, you can easily pick up a blender like this for under £50, and there is no need to spend any more than this, to own a good high quality blender. The more expensive blenders will be more powerful and are capable of making things like spreads and dips. They are also capable of making dough, chopping vegetables, making cake batter, making soup etc. For a simple cocktail like a Cosmopolitan, Martini, Pina Colada, Strawberry Daiquiri etc all you need is something that can crush some ice, and then mix in the alocohol and fruite juice if required. Our advice is that the only person who can decide what price range will meet your needs is you. So if you just want a blender just for blending ice and drinks, then get a good quality basic blender, that will last for a very long time. If on the other hand you need a blender that can not only crush ice but can also grind coffee beans, nuts and seeds then you will have to spend more so as it has the right features to do that full range of tasks. Like any product certain brands in the UK market have built up the trust of buyers over time. So when it comes to blenders some of the brands have become popular houehold names. These include brands like Nutri Ninja,Hamilton Beach, Aimores, VonShef and Andrew James. When it came to our top list of blenders just below we have included a selction of blenders made by these brands. That way we here at the "Love Your Kitchen" website know you the potential buyer are assured of quality and value for your money. In this section we include the top 3 blenders priced at under £50. For the specific purpose of being able to make great cocktails, then any of these three will do a very good job for you without having to break the bank. We have listed those below and then underneath that we have done a concise review of each blender, and included the important facts about it. If you click on any of the product names above, you can read a summary review on each blender. Buyers say this is a good versatile blender that is excellent for making cocktails, but can also be used as a general purpose kitchen blender if you also need it for that. It is at an excellent price point and the brand is well known. 64% of all buyers give this one a full 5 star review and 7% gave it a low review rating. The complaints were mainly down to the blender over heating. Overall though buyers rate this one highly. It comes with 4 attachments. This one is not a good choice for frozen vegetable or fruit, but it can handle ice really well. Buyers say this is a very good choice for ice crushing and fruit crushing making it ideal for cocktail making. It can also grind and blend smoothies if you also need to do that. The important thing is that it does the basics very well. 66% of all buyers give this one a full 5 star review and 8% gave it a low review rating. The complaints were mainly down to those buyers saying it was not that good at making juices. Overall though buyers rate this one highly. There is no automatic cut-off on this one, so you just need to be careful that it does not over heat. Buyers thought this one was very good value and the accessories were also very useful. Opinion is divided on this one according to the many buyer reviews. It does work great on ice but according to around 18% of buyers is not that great at juicing or making smoothies. 70% of all buyers give this one a full 5 star review and 18% gave it a low review rating. The complaints were mainly down to the blender stopping working and having to send it away to get it fixed under warranty. In this section we include the top 3 blenders priced at under £100. If you can afford a little more in your budget, then you will get a higher quality blender. For cocktails the cheaper ones work just as well. The benefit of a slightly more expensive one is that they are just more powerful and get the job done faster. They are also a higher quality build so will last longer. If you can afford this one, then this is the one that we would recommend. Everything is simply better about this blender and that includes the size of the containers,the immense power of the motor,the build and structured design, along with the pre-programmed settings. The size (75oz / 2.2 L) of Aimores blender makes great smoothies and is amazing at blending frozen fruits and ice. 95% of all buyers give this one a full 5 star review and no buyers gave it a low review rating. We think this one is the best value for money as long as you can find it for under £100. If you want a blender that works fast, is reliable and will help you quickly and easily make cocktails, then this would be our number one choice. This one has a high buyer satisfaction rate of 86% and is made by the same brand as the one above. This one is still highly rated but not as high as the one just above. This one is however fairly new to the market so any ratings are based on a low number of reviews. 88% of all buyers give this one a full 5 star review and 12% gave it a low review rating. The couple of complaints were from people who thought this blender looked cheaply made. We will update this particular blender when more information becomes available from buyer reviews. The BL1200 will crush any strength of ice, the blades just needs to get in contact with it to crush it to pieces, so use this function with batches of ice. This is an expensive enough blender and it gets mixed reviews. 58% of all buyers give this one a full 5 star review and 13% gave it a low review rating. In this section we include the high end blenders and there are quite a few to pick from in this particular price range. I enjoy cooking and love using a whole variety of small kitchen appliances. On this website, I review many of the best kitchen gadgets that are fun to own, and even more fun to use.